We offer a wide selection of recreational classes and programs for people of all ages and abilities. Please check our quarterly recreation brochure for our latest offerings. Are you an instructor that is interested in teaching a class at the community center? Submit a class proposal today! Keep an eye out for this mailer, hitting homes soon! Submit your completed registration form and payment to our front desk staff. Fax your completed registration form to 818-880-2953. Call to confirm your fax has been received. 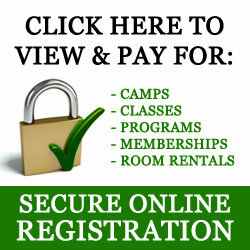 View and register for classes, camps and programs through our Active website. A full refund will be granted if the request is made at least two (2) business days prior to the date of the fist class meeting. Refunds requested before before the start of the second class will granted on a pro-rated basis. No refunds after the start of the second class unless a medical emergency arises and we are given a doctor’s note. Due to the nature of camps, we will not issue a refund unless the request is made at least 5 days before the start of camp. In the event the community center cancels a class, program or camp, a full refund will be issued.